Hard, heavy objects have always been just the thing for mashing your opponent's head into pulpy mud. And though we at Strongblade do not tolerate or condone the use of our replicas for any sort of violence, we do admit that there must have been a strong satisfaction in vanquishing your opponent with a powerful blow from a flanged mace. In the heat of battle, adrenaline pulsing and anger at the foe in full bloom, it must have been a most fulfilling (and yet horrific) way to discharge pent up frustration and claim vengeance against an enemy who you felt had wronged you and your country. The mace was developed as a way to crush bone, muscle, hair, pores, teeth, cartilege, fingernails, veins, arteries, organs, gerbils, and anything else that it came into contact with. It could do this even if an opponent wore light armor, since the power of the blow would transfer through the armor into the body. The flanged mace could do the same thing, except that it could actually compromise the armor, causing even more horrific wounds by puncturing the human body as well as crushing it. The flanges could also drive shards of armor into the wound, giving the victim what historians like to call a "bad day." Even if it didn't actually penetrate the armor, such a mace could at the very least damage even the hardiest of plate armor, making it very difficult for the opponent to move. This particular flanged mace is from late 1400s and early 1500s. It's interesting to note that while Europeans were transforming themselves into perfectly educated and noble Renaissance gentlefolk, they were still creating head-mashers like these. 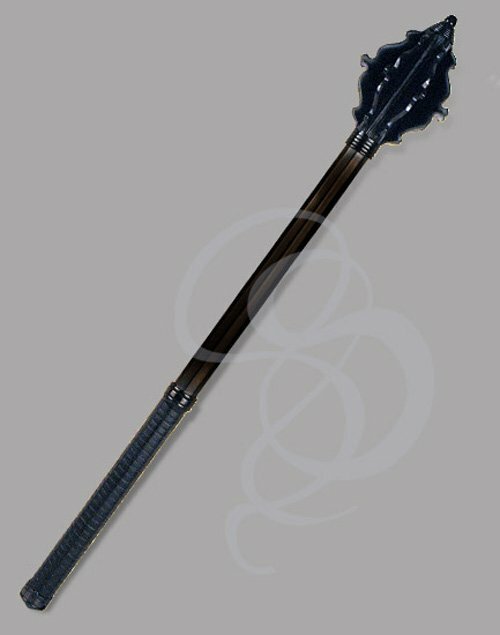 The mace is made from an extremely high quality high carbon steel. It is coated and blackened, and put together with an insane amount of care and precision. The lower half of the shaft is wrapped with a high-grade black leather, which provides a fantastic grip and a comfortable hold. A smooth hole is bored through the base of the shaft for insertion of a leather thong, or for hanging on a pin or nail. The mace has eight flanges, typical of Italian and Germanic maces of the period. The flanges were pointy parts (to speak technically for a moment) that made it easier to drive through armor. The mace is forward-weighted for better leverage when swinging and about as satisfying an object to swing as you can find. Please make sure there are no humans or gerbils near you if you swing it, and take care not to bash yourself with it. It will hurt very much if you do.